Spotless Services offers so much more than just residential cleaning and commercial cleaning services, we've also become New York City's go-to service for carpet and floor cleaning and maintenance, retail and industrial facilities maintenance, handyman services, residential and commercial painting, and the list goes on. Whether you're located in Manhattan, Brooklyn, Queens, Bronx, Staten Island, the Rockaways, Long Island, Nassau County, or Suffolk County, there really are no tasks too big or too small. If it needs to be done, Spotless can and will take care of it for you. This company is absolutely phenomenal... I couldn't be more pleased with [their] skill, professionalism, and responsiveness. 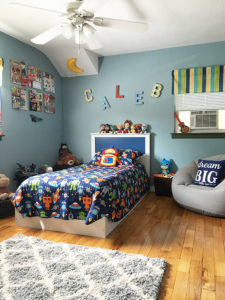 Big Kid Rooms? We Can Do That! Please don’t hesitate to contact Spotless for a consultation on projects such as “big boy rooms,” and any other project you and the family can dream up!